A hamstring rupture or strain, or a “pulled hamstring” as it is commonly called, is a stretch or tear of the hamstring muscles and/or tendons. This is a very common injury, especially in activities that involve sprinting or explosive accelerations. A common cause of a hamstring strain is a muscle imbalance between the hamstrings and the quadriceps, with the quadriceps being much stronger. The hamstrings actually consist of three separate muscles that work together to extend the hip and flex the knee. 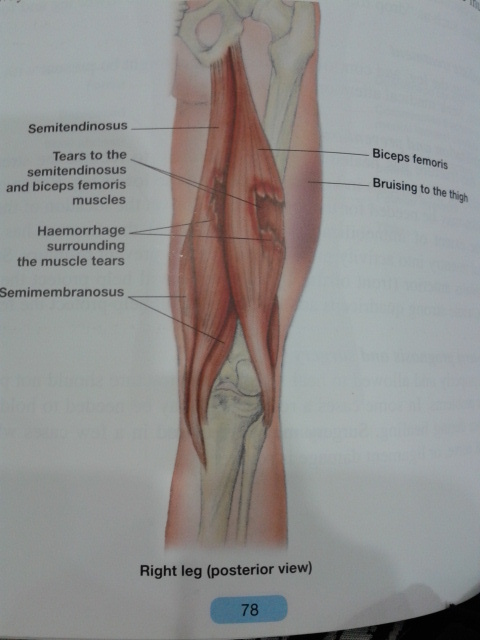 The three muscles of the hamstrings are the biceps femoris, semitendinosus, and the semimembranosus, and any of these can be strained. Commonly, minor tears happen in the belly of the muscle closest to the knee. Complete tears or ruptures usually occur when the muscle pulls away from this attachment as well. Strength imbalance between the hamstrings and quadriceps. Forceful stretching of the muscle, especially during contraction. Excessive overload on the muscle. Pain and tenderness in the hamstrings, ranging from very little with a Grade 1 to debilitating Grade 3. May affect the ability to walk, causing symptoms ranging from a limp to a complete inability to bear weight. Swelling with Grades 2 and 3. Pain and tightness in the hamstrings will continue to get worse without treatment. The tightness in the hamstrings could lead to lower back and hip problems. Untreated strains can continue to progress to a complete rupture. Grade 1: Ice, anti-inflammatory medicines. Grade 2 and 3: R.I.C.E., anti-inflammatory medicines, seek medical help if a complete rupture is suspected or if walking unaided is impossible. Heat, massage and very gentle static stretching can be used after 72 hours to promote blood flow and healing. Stretching after the initial pain subsides will help speed recovery and prevent future recurrences. Strengthening the hamstrings to balance them with the quadriceps is also important. When restarting activity, a proper warm-up must be stressed and a gradual increase in intensity should be followed. Hamstring strains that are fully rehabilitated seldom leave any lingering effects. Complete ruptures may require surgery to repair and long-term rehabilitation. Call (+65) 6471 2674 (24 Hour) to make an appointment to see our knee specialist regarding your hamstring rupture today.